Persistence of global hunger keeps the food question alive. The twin food price spikes in 2006-08 and then again in 2011-12 tends to indicate that the global food crisis may be more of a systemic phenomenon. The conspicuous paradox of the contemporary global food situation is that the recent price volatility has occurred simultaneously with significant increase in food production, particularly since 2002. In contrast, when world per capita food production was declining since the mid-eighties for a decade and a half, food price spikes and volatility was never witnessed. What is driving the food prices to higher levels and creating incentives for rapid expansion of output needs to be explained to understand the larger political economy of global hunger. Conflicting views exist regarding the identification of causes behind the global food crisis. There are at least three lines along which the opinions are bifurcated. The first issue of contestation is whether the food crisis is an environmental phenomenon or a man-made disaster. The second line along which opinions are divided is whether the food crisis is essentially a result of short-run changes and developments in the world or is it the result of the long-run trajectory of economic policies that are driving the capitalist system. Finally, there is also the need to identify the relative importance of the global factors and local ones within the boundaries of nations in causing the widespread and persisting incidence of hunger. The argument citing environmental factors as the major reason behind the food crisis point towards the phenomenon of global warming and climate change, which had led to shortage in production of grains, particularly in some of the major food-grain exporting countries. 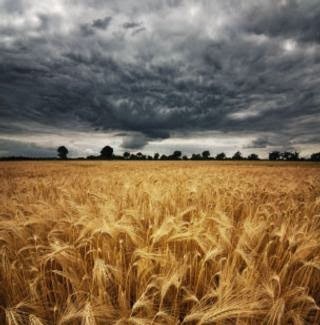 The drought-led Australian wheat disaster and the exceptional fall in wheat production in Ukraine in 2006-07 due to the excessively hot climate in Europe have been identified as major causes behind the demand-supply mismatch in the global market leading to manifold increase in wheat prices. Other major wheat exporting nations like Argentina also faced a decline in production. The conventional hypothesis places shortage in food production relative to consumption requirements as the central cause for rising food prices. The world cereal output in the current decade (Table 1) exhibits a decline for two consecutive years in 2005-06 and 2006-07. The fall in the supply of grains in the global markets drove the prices up. It is argued that the food prices have not shown any marked inflationary trend since the oil-shock in the 1970s till recently, essentially due to the expansion of food production at par with the consumption requirements of a growing population. The FAO real food price index consistently declined since the mid-seventies till around 2000. After 2000, the trend showed an upward movement, which turned into a steep increase post 2006 (FAO 2008). While it is true that the world cereal production declined by 3.6 percent and 6.9 percent in 2005 and 2006 (FAO, 2008), driving down the global stocks to a new low, the food prices continued to remain high even after the cereal output recovered in 2007. The decline in world grain production in 2010 was even more negligible at 1.8 percent. These occasional declines are too minute to explain the secular and sizable increases in food prices. The other argument that is also prevalent is that export restrictions put further pressure on global grain supplies and also adds to the inflationary pressure. While it is true that many countries resorted to such restrictive measures in order to shield their populations from the rising global food prices, the overall grains exports do not show any declining trend during this period. Between 2004/5 and 2011/2, the per capita world grain exports increased from 37.4 kgs to 49.3 kgs, each year in the period except 2010/1 registering an increase (USDA PSD database). The fact that the food prices are expected to remain high over the current decade indicates that economic policies and the nature of development process that the world has been witnessing are also playing a significant role in generating the crisis. The increasing conversion of food grains to bio-fuels, changes in consumption pattern among the world population, changing food and trade policies across countries are some of the important policies and developments that have adversely affected the food situation in the world. The supply-constraint argument runs into a major empirical and theoretical problem. The objection comes from a structural viewpoint of the issue over a longer period. This view questions the very assumption of food inflation keeping low, post the oil-shock, as a result of expanding production. As shown in Chart 1, the per capita cereal production in 1984-5 was 343 kgs and declines gradually to 290 kgs by 2002-3. 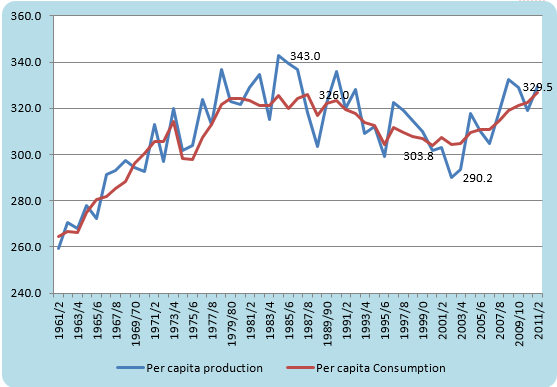 Based on this declining per head cereal output, Patnaik (2008) argues that there should have emerged a massive food shortage during this period given the fact that average per capita incomes across the world has increased in this period. As the income elasticity of food consumption is positive, per head consumption should have increased and generated inflationary pressures in food prices. However, this did not happen due to the deflationary economic policies in the eighties that arrived as part of the Structural Adjustment Programmes in the developing world. Such policies played a major role in suppressing mass consumption in large parts of the world and kept prices within control. As evident from the chart, the per capita world grain consumption also declined since the mid-eighties up to the turn of the century. The usual attempt to justify this declining cereal consumption is by attributing it to the diversification of consumption that occurs with rising income. However, this argument is also erroneous as it is only the direct cereal consumption that declines with dietary diversification that accompanies rise in incomes. On the other hand, the higher volumes of animal products like meat, milk products, etc. that is consumed, also embodies food grains that were used as feed to produce the animal product. As there is a loss of energy from food grains when it is converted to animal products (by using food grains as feed), a greater volume of animal products needs to be consumed to obtain the same levels of energy that is possible to obtain from direct consumption of food-grains. What this essentially means is that the consumption of animal/milk products actually require a higher volume of indirect consumption of food-grains than would have been necessary if the cereals were consumed directly. Thus, any voluntary diet diversification towards animal products with increasing incomes lead to a higher total (direct plus indirect) consumption of food-grains and not a lower one as is commonly perceived. This increase in grain demand is faster in economies like the US where live-stock production is predominantly an industrial activity consuming large quantities of feed, but even in developing countries like India, where livestock feeding is less industrial in nature, the total demand for grains in the economy cannot be expected to decline with diet-diversification though the growth in demand may be slower. One possible supply-side pressure on the cereal prices can be due to the soaring oil prices in recent times. The indirect use of fuel in agricultural production through industrial inputs has partially transmitted the high oil inflation into food production. Many studies have emphasized that the increased prices of intermediate inputs like fertilizer, chemicals, fuel, lubricants and electricity that are supplied to agriculture by the industry, have raised the break-even prices for all cereal crops. However, as Chand (2008) points out, the transmission coefficient of crude oil prices on cereals is only around 0.18 and only a small part of the food price increases can be explained through this argument. The share of energy in total costs of cultivation even in a highly mechanized agriculture like that of the US is only 16 percent. This necessitates us to look beyond the supply-side factors and focus on the changing structure of demand for food-grains in the recent past. A common argument that is harped on by the developed world with regard to the current food crisis is the impact of the changing consumption pattern of the population in emerging economies, particularly in India and China (USDA, 2008, IMF Report, 2008). The argument goes like this. China and India has been the two fastest growing economies over the last decade. With the rising per capita income in these countries, the rich and middle classes in the country are undergoing dietary diversification and fast approaching the western dietary patterns. This should cause an increasing demand for food grains in these countries based on the premise that diversified diets containing higher proportion of animal products lead to a larger indirect consumption of grains, something that we discussed earlier. The data for grain utilization in India or China does not really support this hypothesis. The total food availability in the country accounts for both the direct and indirect consumption of food grains. In the Indian case, neither the total food availability nor the per capita food availability provides any support to the ‘increasing consumption’ theory. Both the variables show a declining trend in the current decade prior to the global food price inflation. The total food availability declined from 189.5 million tons in 2002 to 170 million tons in 2005 and then recovered back to 189.1 million tons by 2010 (Table 2). Similarly, the per capita food availability declined from 180.4 kg per year in 2002 to a low 154.2 kg per year in 2005 and again increased only moderately by 2010. In the longer run, the total availability of food has increased when we compare the current decade with the nineties. However, this increase has been slower relative to the population growth in this period and hence the per capita food availability in 1991 or 1996 was much higher than the later years. On the whole, one can observe that there is no sign of increasing consumption; rather the reverse is more prominent. The Chinese situation is slightly different from the Indian case although the over-consumption argument is not conclusively validated. 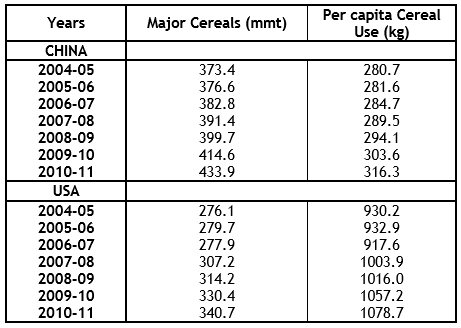 Table 3 indicates that the total cereal availability has increased in China by around 60 million tons between 2004 and 2010. 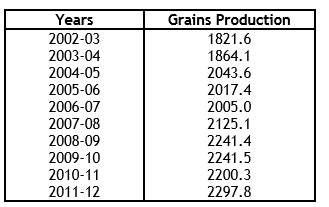 There is also a rise in the per capita grain consumption in China by 35.6 kg during these years. However, this increase is much less compared to what the USA has witnessed in the same period. The US per capita cereal consumption has escalated by 148.5 kg in this period, more than 4 times than that in China. Intriguingly, the bulk of this increase in the US has occurred due to the diversion of large amounts of corn production to its ethanol industry. The FAO 2008 report adopts a more realistic position on this issue. They rightly point out that even if there is some increase in consumption in largely populated countries like India or China, it is not a major factor in the world grain market as cereal imports by these two countries have declined from an average of about 14 million tons in the early 1980s to around 6 million tons between 2006 and 2009. A major reason identified behind escalating food prices is the increasing conversion of grains for non-food uses like production of bio-fuels like ethanol or bio-diesels. With high oil prices and concerns over excessive carbon emissions leading to global warming, bio-fuels have emerged as the favored substitute for fossils fuels like petroleum and diesel. However, the viability of this transformation remains under question, particularly when one assesses the food-energy competition that has intensified with this change. The traditional dual food-feed competition has been transcended into a triangular competition between food, feed and industry. There is now an ever-increasing competition over food-grains between direct consumption for replenishing human energy requirements, feed use of grains for animal products and fuel demand by gas-guzzling automobiles. A number of countries have set targets of bio-fuel use in the near future. The US has been diverting huge amounts of corn for ethanol production in the current decade. The Feed Grains Database of the USDA shows that the US alone used around 995.5 million bushels of corn for ethanol production in 2002, which more than doubled to 2119.5 million bushels in 2005 and further rocketed to 3700 million bushels by 2007. In terms of million tons, this amounts to an increase of corn-use for bio-fuels production from 25.3 million tons in 2002 to 127.5 million tons in 2010; a five-fold increase within less than a decade! Of this, 86.8 million tons of the increase has occurred in just five years, between 2005 and 2010, when the maize prices have gone through the roof. During the first price spike in 2007, the US was diverting around 30 percent of total corn output for ethanol; in 2011 during the second price spike, the corn-use in ethanol industry was more than 45 percent of the total corn output. As I have argued elsewhere (Banerjee, 2011) and pointed out by other scholars (Mitchell, 2008), the use of corn in ethanol production creates a strong demand-side linkage between oil prices and food prices. Ethanol being a substitute for gasoline, ethanol and corn prices starts chasing the crude prices when the latter increases. This enormous use of corn output for bio-fuels by the US has serious implications for the corn export prices, given that the US produces one-third of the world corn output and supplies at least half of the global corn exports. Not only are corn prices pushed upwards as a result of this but the cereals, which act as the substitute of corn particularly in the livestock feed markets, also witness a rise in demand and prices. Thus, prices of soft grains like wheat and rice also witnesses increases due to this phenomenon. Bio-fuels production and the conversion of food to industrial energy is definitely one of the primary causes for the contemporary food crisis and hunger. The other significant contributor to the escalation of food prices, which cannot be ignored, is commodity speculation in the futures market. Prior to the collapse of the US housing boom, finance was already shifting from the stagnating housing assets to the commodity markets, particularly in the grain futures markets (FAO, 2008; UN, 2008; Ghosh, 2009). The speculative activity in the wake of excess grain demand has led to fast increases in major grain prices starting from 2006. The exceptional demand in the food-grains markets when grains emerge as a source for energy which can substitute fossil fuel also creates favorable conditions for speculation in grain futures; more so when the oil prices are expected to increase in the near future. The dominant paradigms of contemporary capitalism, primarily the abnormally high-value consumption in a few advanced countries and widespread poverty in large parts of the world, and the preponderance of speculative capital, play a central role in giving a systemic character to the global food crisis. The automobiles owned by the global elite stand to militate against any mitigation of the under-nutrition suffered by the bottom billion and the malnutrition of another 2 million population. Specifically in countries like the US, the celebration of private transport and the destruction of public transport systems have meant that per head gasoline use in the US are astronomically high compared to developing countries. It is evident that the current phase of capitalism is precariously poised between two choices; either the ruling elites end up eating the environment or choose to eat up the few morsels left on the plates of those who produce the surplus and wealth for them. A postponement of a rethinking of the fundamentals of contemporary capitalism is surely a recipe for social turmoil! Banerjee. 2011. ‘Food Feed Fuel: Transforming the Competition for Grains’. Development and Change. Vol. 42(2): 529-57. Chand, R. 2008. ‘The Global Food Crisis: Causes, Severity and Outlook’. EPW. Vol. 43(26&27): 115-22. Ghosh, Jayati (2010). ‘The Unnatural Coupling: Food and Global Finance’, Journal of Agrarian Change 10(1): 72–86. Mitchell, Donald. 2008. ‘A Note on Rising Food Prices’ Policy Research Working Paper No. 4682, Development Prospects Group, World Bank. The food availability/use for a country is the Net production (after adjusting for seed and wastage) plus Net Imports minus Net Addition to Stocks. The E.U. has set a goal of 5.75 percent of motor fuel use from bio-fuels by 2010. The U.S. has mandated the use of 28.4 billion liters of bio-fuels for transportation by 2012. Brazil has stipulated that all diesel oil contain 2 percent bio-diesel by 2008 and 5 percent by 2013 while Thailand will require 10 percent ethanol in all gasoline starting in 2007. India has mandated a 5 percent ethanol blend in nine states while China is currently requiring a 10 percent ethanol blend in five provinces.